The alarm over the Zika epidemic has diminished since last summer, but the risk of contracting bug-borne diseases remains high. The CDC reports that cases of disease from mosquito, tick and flea bites more than tripled in the U.S. from 2004 to 2016, and the rate of emergence of new or newly recognized pathogens is increasing. Since 2004, nine new germs spread by mosquitoes and ticks have been discovered or introduced in the U.S, including the mosquito-borne viruses Zika and chikungunya. Tick-borne diseases, primarily Lyme disease, account for much of the increase. The incidence of Lyme disease has nearly doubled since 2004, with 36,429 cases reported in 2016.1 The problem is likely much larger because the actual number of Lyme disease cases may be 10 times higher, affecting 300,000 people annually. Experts predict bites and infections will continue to rise because of a warming climate that expands the habitat of species such as ticks and mosquitoes. With the increased need for protection, it is important to recognize that there is no perfect and completely safe way to prevent bug bites. 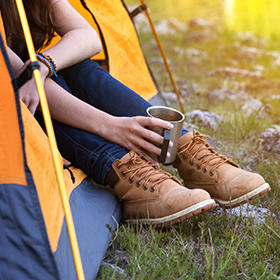 Many people are concerned about the possible drawbacks of common repellent active ingredients, like DEET. 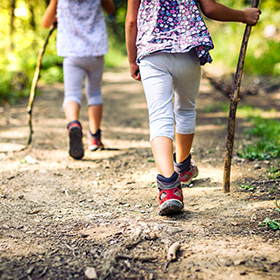 EWG researchers have analyzed the science in depth and found that, with proper application and precaution, our recommended active ingredients – Picaridin, DEET, and IR3535 – effectively reduce risk from life-altering disease and have very low toxicity concerns. The Environmental Protection Agency regulates insect repellents and requires companies to submit data to verify their claims of repellency. The problem for consumers is that a product may not provide as many hours of protection as listed on the product label. This is for many reasons, including different test conditions, different types of mosquitoes tested and the differences in repellency for different individuals. EWG recommends using an EPA-registered repellent. When vector-borne disease is a concern, start with the repellents that have most tests showing efficacy in different situations. These repellents offer a high level of protection from a variety of biting insects and ticks, have good safety profiles, and are registered with the EPA, so they must provide data on both efficacy and toxicity. If a product is not working for you or your family, we recommend trying one with a different active ingredient. The EPA maintains an online repellent search tool to help you find products that it has reviewed. DEET's safety profile is better than many people assume. It has a long history of use, is very effective in reducing bites and has minimal safety concerns. DEET isn't a perfect choice, nor the only choice. But weighed against the consequences of a life-changing disease, such as West Nile virus, we believe it is a reasonable choice. While products based on botanical extracts do not make our top picks, they may be worth trying if bug-borne diseases are not known to be a problem where you are going. But many of these products contain allergens in highly concentrated forms. Effectiveness varies widely. Before traveling, check the CDC’s Zika travel map for up-to-date Zika information. 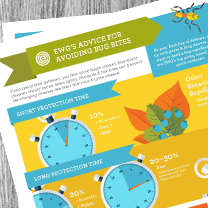 Sign up today to get a downloadable PDF version of EWG’s Guide to Bug Repellents – delivered right to your inbox. *By signing up you will also receive EWG's exclusive email updates, action alerts, promotions to support our work and environmental tips. You can opt-out at any time. No repellent is 100 percent effective. Click one of the options below to find your best bet. Treated Clothing: A Safe Option?